I awoke, took a shower - how nice. 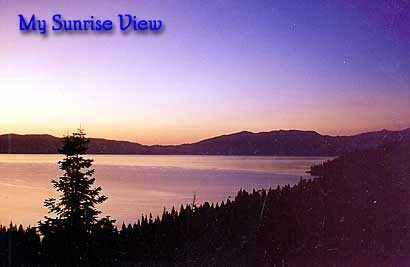 It had cleared quite a bit overnight so the sunrise over Lake Tahoe was spectacular. Distant clouds and the remaining smoke made it real interesting. I got up and made some coffee. Another nice thing, not having to go out and get coffee, but get up and just make it! James came downstairs and asked if I wanted to do any laundry. I sure do! I got a week's worth of clothes that could be considered toxic waste in 14 states. While James was on the phone taking care of business, Jones set up a playback of some of Roger Waters' live album that James had been mixing in 5.1 format. It was just wonderful. I had heard the stereo mixes when James and I were working on Roger's album last summer, but it was really great to hear the 5.1 sound with the picture. We all went upstairs and talked for a while about me driving with James to San Francisco so he could get his 600 mile service on his ST4, but I had to decline the offer - my tires were getting pretty worn, and besides, it was time to get home. Since this was kind of a whirlwind tour, I had traveled every day and I was starting to get tired of that. Besides, leaving for home today would put me home only a couple of days before I had to go back to work - Just enough time to unpack and clean up. I had to go home, but before I left Lake Tahoe, I helped James get the rest of the saddlebags and hardware mounted on his new ST4s. He was very pleased with his purchase. We hugged, said goodbye, and I headed down the driveway towards the highway. Turning south - towards home - I made my way around the lake. The smoke beginning to build up again after the morning's calm and clear. Through the western most part of South Lake Tahoe and back to Hwy 89 - Over Monitor Pass towards Hwy 395 on the eastern side of the Sierras. Monitor Pass was great. I don't think I saw 10 cars between Hwy 89 and Hwy 395. The highway had been recently repaved so I had a chance to jump on it a bit. But my tires, getting a little on the worn side, I wasn't able to get too crazy, but I did have a great ride. Last year, my travels also took me over Monitor Pass, but a little later in the year which brought out the most beautiful autumn colors I had seen in years. An incredible site! Reaching Hwy 395 and turning south, I wasn't sure if I wanted to ride all the way home that day because I left Lake Tahoe quite late,so I decided to stop near Lee Vining for the night. There, I could have a casual dinner in town and then go back to camp and enjoy some more beer and write the days experiences in this journal. I usually stay in a camp in the meadows just below Tioga Pass, the high country entrance to Yosemite, but this time I wanted to more closely check out some of the other places to camp near here. Just north of Lee Vining, there's Lyle Lake. Just beautiful. There are some really nice places to camp but there weren't any available except for a couple, way in the back. All of these campsites are along a creek that is the outflow of the lake. Most of the sites are quite large and isolated from each other and feature nice grassy places to pitch tents. But since none were available, I chose to move on to the camp areas off of Tioga Pass Road. There's a big meadow there with some excellent camping and fishing. There I found that most of the sites had been washed out by a freak thunderstorm that Eddie was caught in a couple of weeks ago. And I mean washed out! Tables were washed into trees. Near the stream, the roads were barely passable on the - street only - FJ. However I was able to find a nice place with a flat sandy spot to set up my tent. I staked out my site, paid for it, put up my little piece of paper and headed back to town for some food. There are quite a few places to eat in Lee Vining. I chose a new place with a nice outdoor patio - Bodie Mike's BBQ. It boasts a full bar and a really nice salad bar. The Margaritas tasted good, but didn't do anything. No buzz. If you're a veggie, you won't like this place. It's for meat eaters only. Chicken and ribs - that's it. Oh yea...they do burgers, have good French fries and also have a veggie burger available. After dinner I went up the street and bought a few t-shirts, picked up some beer and munchies and headed back to camp. I set up my bed, opened a beer and began to write what you're reading now. Before lon, it was dark and I found myself writing with the light from my flashlight. With 3 beers gone, I headed for bed; my last night camping on this trip.